The 1950’s were a unique time in America. Life was peaceful and our economy was booming. The baby boomer generation was energized by Rock and Roll and television. 1950’s cars and trucks were the most ornate masterpieces that Detroit ever produced. In Tarrytown, NY, General Motors produced Chevy and GMC trucks. In 1950, a cutaway ½ ton Chevy pick up was delivered to the Amerio Refrigeration Company in Union City, New Jersey. The truck was customized and turned into an ice cream truck with a cold plate refrigeration system. This system replaced old style dry ice trucks. The compressor ran off of 110 volt as a plug in unit. The box was built with oak, outfitted by aluminum panels on the outside and cold plate freezers on the inside. The truck was sold to an independent vendor as a Peter Pan ice cream truck. Fenders were green and a large picture of Peter Pan was painted on both sides. In its first six years, the truck roamed the Crown Heights section of Brooklyn. A special selling spot was Ebbitts Field during Brooklyn Dodger games. In March of 1956 with two kids and a new home, my father re-entered the ice cream business purchasing this Peter Pan truck for $1,200 in Brooklyn. With my grandfather, Joseph Nuzzo behind the wheel, they towed the truck back to Staten Island. This is where the story begins… In 1956, Staten Island was far from Brooklyn and very different than it is today. It was a rural vacation spot lined with beaches in the south shore and farms and wooded areas on the north, east and west. My father’s ice cream route was on the north shore throughout Westerleigh and Castleton Corners. My father transformed the truck from Peter Pan to Howdy Doody. In September, 1958 I was born. 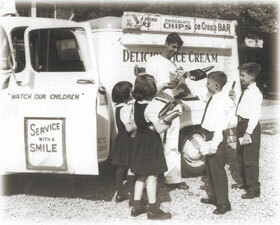 That year ice cream trucks produced the new soft ice cream, making it tough for Good Humor, Bungalow Bar and independent vendors who sold pre-packaged hard ice cream. The streets of New York City were soon popping with Mister Softee jingles and Freezer Fresh ding bells. It was very tough competition! As a young child I was infatuated with the fact that my father operated an ice cream truck. I was a hit amongst all my friends at St. Rita’s Grammar School. When he came home at night after his route was done he would restock boxes of ice cream. I would go in the garage and pick an ice cream to eat. I would sit behind the wheel in my pajamas, eating my ice cream and pretending to drive and sell ice cream. My room was just above the garage and the soft hum of the compressor put me to sleep at night. In September 1966 my father had his first heart attack after selling ice cream one evening. When he recovered, he continued work for the NYC Water Department. In the spring of 1967, my oldest brother John turned 17, got his drivers license and he began to sell ice cream. John sold ice cream throughout college until he graduated in 1972. I convinced my father to not sell the truck because in 3 years I would be 17. My Uncle Sam Cucciniello stored the truck in his garage in Bulls Head, Staten Island. In 1974, John decided to go to graduate school and I convinced him to sell ice cream during the summer and promised to work for free. The truck needed a new engine and John had to shell out $1,200 for a rebuilt 1954 Chevy 235 cubic inch engine before even hitting the streets. I was very good at selling ice cream and knew the route. My father and I planned on selling ice cream in September when John left for school. Unfortunately Dad had another heart attack, this time with a lot more damage to his heart. He survived, but at 56, could no longer work. Fortunately he was able to retire but his pension was small. My mom returned back to work making dresses. In September 1975 I turned 17 and was ready to sell. Unfortunately, fall was not the time to sell ice cream. In the spring I didn’t go on Senior Trip to get my truck ready. I replaced the clutch and installed a re-built transmission. I began my career as an ice cream man in April 1976 and regularly competed against a few “Good Humor” trucks, Mister Softee, Freezer Fresh and a few independents. Staten Island was growing rapidly. The Verrazano Narrows Bridge opened in 1964 and new neighborhoods were springing up all over. People from Brooklyn were buying new homes and trying to recreate the Brooklyn that they left. Between senior year at Moore Catholic High School and senior year at New Jersey Institute of Technology, I built a tremendous route and business. Baby Boomers were starting their own families and wanted their kids to buy ice cream from real ice cream trucks that rang bells instead of trucks that were candy stores on wheels. I managed to pay 100% of my college bills selling ice cream. I graduated from NJIT in 1980 with a BS in Civil Engineering and started my career as a Management Trainee with Brooklyn Union Gas Company that summer. I decided to continue selling ice cream at night and worked both jobs.